But hanging over all of this is my dissertation, the topic of this blog. It needs to be a book. There are even publishers willing to talk to me about. But it has to get done. Anyone can tell you that a dissertation is not a book and my writing skills are good enough (not amazing, but pretty good) that with some work the book can be more readable than the dissertation by several orders of magnitude. Plus, while the book won't be as analytical as the dissertation, the fundamental question has inverted. In the dissertation I asked, "Why did the VP go from nothing to something." But now I want to know, "What does the President gets from the VP?" The first question has been answered adequately - not just by me. The second seems more interesting and insightful. My dissertation is the raw material, but I have to break it apart and reconstruct it. It was hard enough assembling the 130K words of the dissertation. Now, I need to break it all down and rewrite it. It's a lot of work, and I have a day job (which also has a lot of writing projects.) Doing this takes time and I have not had tons of it between a real job, a long commute, and kids who need to be driven places constantly. I thought I would take the holiday week off and really invest some time into the project. I have a decent intro and my Mondale chapter is in pretty good shape. But that's been my status quo for over two years. I thought if I put in some serious time up front and sort of "broke the seal" I could get into a rhythm and bring the project together. This involved going to bed and waking up early (both of which I hate) and getting serious writing hours in each morning. It hasn't gone so well. Over at War on the Rocks, the eminent Van Jackson has been journaling his efforts to write a book in six months. Honestly, it's been heartening since he's terrific and like me knows his topic back and forth (so he isn't doing fundamental research, just writing.) Still, some of his good days are only a few hundred words and he too loses hours to rabbit holes and anomie. So, in that spirit, I thought I too would share my writing experiences, intermittently. Of course in my case, this might just be another procrastination mechanism - writing this when I should be, you know, writing my book. But, here the words flow, whole post was less than 30 minutes and it is nice to get this stuff off my chest. this research. My regular readers (should I have any) know that the central premise of my work is that outsider presidents find themselves relying on insider vice presidents. But I keep finding that I want to know more, what exactly is it that these insider vice presidents know that no one else can tell them? I'm still wrestling with that question, with mixed success. But in putting this presentation together I did find a common trope that supplements with outsider/insider paradigm. Usually, one of the two is more focused on policy and the other is more focused on politics. Carter, the engineer/technocrat famously hated to consider things politically - he wanted the optimal solution. Mondale was his "invaluable political barometer." The Clinton-Gore relationship was almost the exact opposite. Few figures in recent history have had the kind of politically sensitive antenna of Bill Clinton. Gore, on the other hand, was the policy-wonk. The Obama-Biden relationship appeared similar to Clinton-Gore, with Joe Biden, a talented retail politician, supporting the famously cool and analytical Barack Obama. The Republicans on the other hand seemed to elect presidents more focused on the politics, with vice presidents focused on the policy. Reagan was famously big picture, while his Vice President took on details. His son, Bush 43, took on politics, while his super-staffer VP, Cheney, focused on the hard policy issues. Although Bush-Quayle is an outlier, since Bush was an insider who did not particularly need his vice president's advice, he remained a policy-focused President, letting his VP tend to political affairs. Seems like a pretty neat way to characterize the President-VP relationship. The problem is that this explanation is much, much too neat. None of these figures - who rose to great heights in national politics - can be considered unsophisticated on political or policy matters. It is more of a continuum, with Gore, Carter, and Cheney on a particularly hard end of the non-political and most others closer to the middle. Still not happy, because it simplifies too much. What do we mean by politics, anyway? Cheney, was extremely astute in legislative strategy. When the Soviets invaded Afghanistan, Carter called for an embargo on grain sales to the Soviet Union. Mondale, worried about the Iowa primaries (Ted Kennedy was challenging Carter for the nomination) advised against it. Carter thought the the embargo was the right thing to do. But he also thought the American people would ultimately rally around the president. Mondale had a tough time campaigning in Iowa - but Carter was right! Gore was not a terribly effective liaison to Capitol Hill (he had served there for a dozen years, but was did not take to the place like Mondale or Biden.) But, Gore pushed himself forward as the spokesman on NAFTA and helped deliver the win. It might be more accurate to say that different people absorb and process inputs differently and that presidents and vice presidents ideally complement one another. But that's pretty generic and hence why we only have a partial paradigm. There has been much news about the vice president recently. And I've been so busy (with Jewish holidays mostly - and I go offline for another in just a few minutes!) so that I haven't even finished my assessment of Pence's influence in the current administration. But there was something else the vice president did that dominated the headlines... something at a football game. 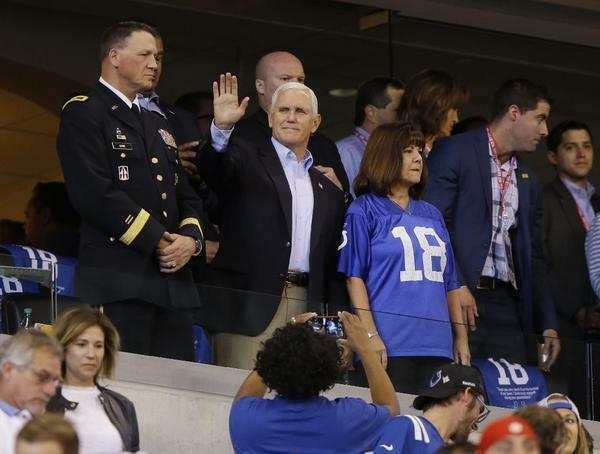 Pence walked out of a Colts game when the 49ers kneeled during the National Anthem. This was part of the President of the United State's feud with NFL players who are choosing to kneel during the National Anthem to protest racism. This has been discussed ad nauseum and I have nothing to add. Although, as a Baltimorean, I have some pretty strong thoughts on the Star-Spangled Banner that have absolutely nothing to do with the current controversy. My interest is the doings of the vice president. Reportedly Vice President Pence is a really big Colts fan. But, when the President heard the VP was going to a game (not just any game, Peyton Manning's number was being retired), the President instructed the Vice President to leave if any players kneeled during the National Anthem. Since several members of the visiting 49ers had been kneeling all season, the outcome was pretty clear. I asked VP Pence to leave stadium if any players kneeled, disrespecting our country. I am proud of him and Second Lady Karen. Whether or not Pence really wanted to walk out, or was doing so at the President's behest, the tweet robbed the VP of any dignity in his walk out. So what should Pence have done? Let's pretend that Pence would not have walked out on the game if given the choice. (He didn't walk out on Hamilton when the cast addressed him directly with a political message.) But defying the president is not a minor thing to do - especially for a vice president. The only way for the vice president to influence policy is through access to the president and presidents do not have a lot of patience for disloyal VPs. This President may be touchier about loyalty than most, but really this applies across the board. The VP is the one person in the administration who cannot be fired - thus disloyalty is particularly problematic. The VP could take stand, spending their term isolated from the president over at the Naval Observatory, perhaps issuing public statements against the administration. This would probably not go well. The president (any president) would savage an openly disloyal VP. And what would this gain the VP? Not much. The president still has significant support in the party and might receive an uptick in support from the opposing party - but hardly enough to offset the significant ideological divides. If the president were in trouble (i.e. being impeached) the VP's smartest play is quiet loyalty. A VP too publicly ready for the president to leave office will not be well-regarded. Ford and Gore stayed out of things and let the process move forward on its own. We are not near impeachment. That's a reality. The VP believes he can still be useful, fixing what he can in a dysfunctional administration. To be effective the VP needs access to the President. And for that, when called upon, having no significant Constitutional authority and, according to Chase Untermeyer, only one true resource to offer the president - time, the VP must kneel before the chief of the executive branch. I know I just wrote a post yesterday analyzing the role of the Vice President in this White House that requires a follow-up. But, like Jews around the world, my mind is elsewhere. We are entering the High Holidays, the Days of Awe. Tonight begins Rosh Hashanah, literally the "Head of the Year." It is the start of a new year and a time of introspection, but also a time to ask forgiveness. 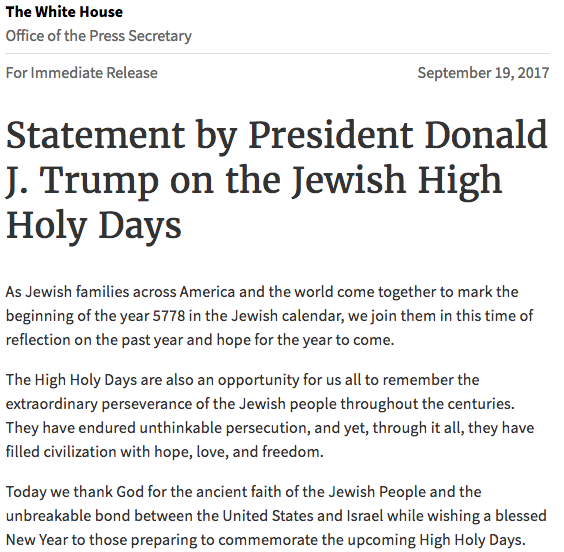 Political leaders in the United States typically send greetings to the American Jewish community on its major holidays. There is nothing terribly remarkable about these greetings. They are like thank you notes for gifts, courteous and necessary. I would not draw any policy conclusions from these statements about these leaders positions on Israel or any other issue of concern to the American Jewish community - or anyone for that. But I did find comparing the Presidential and Vice Presidential statements instructive. The President's statement is perfectly fine. 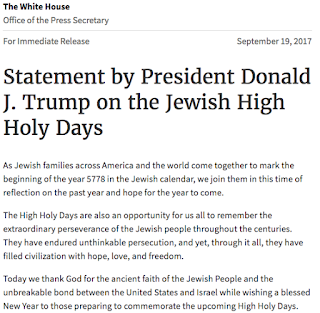 It briefly mentions the purpose of the holiday, had a nod to Jewish history and the place of the Jewish people in the world, and ends by mentioning the deep bond between the United States and Israel. I have nothing to criticize about it. 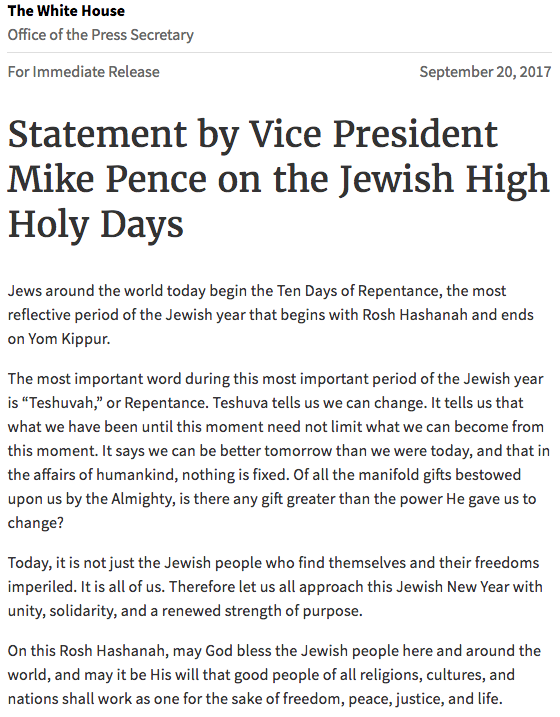 The Vice President's statement, in comparison, is a bit deeper. Only at the end does it give the obligatory best wishes to the Jewish people on their holiday. Instead we get a short homily about the central concept of the Days of Awe - Teshuvah. The statement then extends it to wishes for introspection and a better year for al. 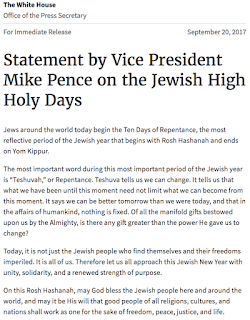 On the one hand, the VP's statement might be a bit too religious and not sufficiently political. But I'm rather impressed with it. It makes specific references to the meaning of the holiday and relates them more broadly to all humanity. It has a voice in way that perhaps the President's statement does not. Within the tangled channels of White House decision-making, the Vice President's office is a fast cruiser amongst a thicket of dreadnoughts. It is smaller than OMB or NSC, but it can choose its fights and focus almost exclusively on meeting the needs of its principal. Thus, it can find a unique voice. Of course Presidents can usually attract the finest communications talent. Another possible conclusion is that the White House staff is starting to function adequately, but perhaps not at a very high level. Shana Tova Umetuka. To a happy and sweet new year. 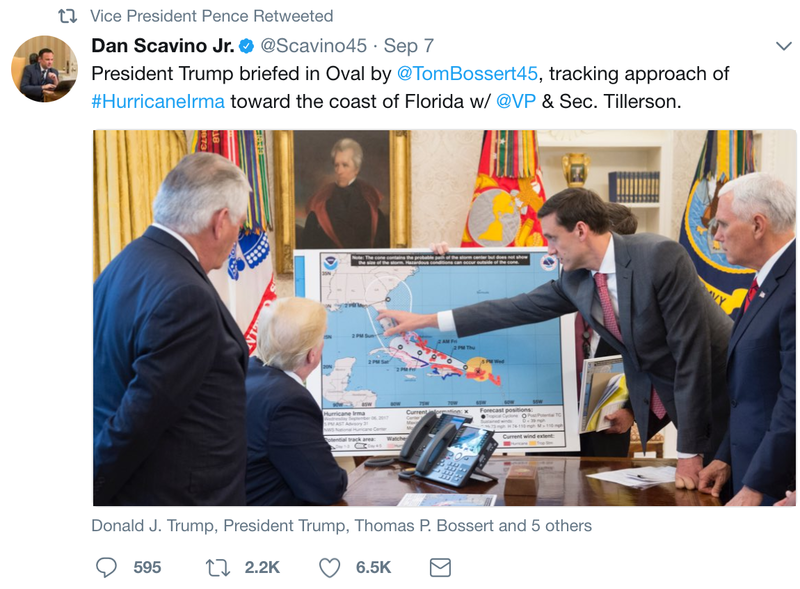 So, here's an overdue installment of VPWatch, my little project to understand the current White House by tracking the Vice President. Two critical terms to consider are access and influence. The latter demands the former, but is not sufficient. If the Vice President cannot see the President or engage with the policy process, the VP cannot hope to have much policy influence. However, as Dan Quayle demonstrated, regular access to the President is no guarantee of influence. Pence has access and a lot of it. Account after account mentions that Pence is at key meetings. When the national security team delivered "American Power 101" to the anti-globalist President at "The Tank" at the Pentagon - Pence was there. The infamous meeting where the President shared his displeasure with the Attorney General - Pence was there. The meeting with Congressional leadership in which the President decided Chuck and Nancy were his new best friends - Pence was there. So the Vice President has access in this administration. Another critical factor in understanding the VP's role is the roles of their allies on the White House staff. This goes way back. In the Carter administration, the President specifically instructed the National Security and Domestic Policy Advisors to appoint Mondale aides as top deputies. Carter wanted to ensure the Vice President was fully engaged. This trend has continued. Reagan appointed VP Bush's close friend Jim Baker as White House chief of staff. This trend has continued and reached something of an apogee in the Obama White House. Such well-placed aides not only insure that the VP is engaged in the policy process, but are a source of influence in their own right. At the same time, the Vice President's staff have played an expanded role in the White House, sometimes becoming critical advisors to the President in their own right. Again, going back to the Carter administration, Mondale's chief of staff took on some critical roles (such as over-seeing a veto override task force) on behalf of the President. Al Gore's national security advisor provided became a key figure in national security decisions. This continued and expanded under Bush 43 and Biden, where the Vice President's national security advisor was also a leading advisor to the president. Both of these situations reflect the outsider President/insider Vice President paradigm. Presidents with limited Washington experience find that they need insider knowledge to get anything done. This creates opportunities for influence by insider vice presidents, but also increased opportunities for vice presidential staffers with Washington experience. So it should follow that Pence allies and staffers are playing an expanded role in the current White House. The former situation is clearly the case, the latter is not as obvious. The most notable Pence ally on the White House staff is Marc Short, director of legislative affairs, who had been Pence's chief of staff when Pence was a congressman. This is a pretty significant role. It fits the model that, over the past 40 years, VPs have played a significant role in congressional relations. Also worth noting, Pence - who appears to choose his battles within the White House carefully - weighed in for Short to get the position. There's another interesting data point, General Kelly, in his efforts to stabilize the White House, has been bringing in more experienced figures. The new director of presidential advance (that means administering the details of presidential travel) had been Pence's advance director. This is not necessarily a position of political influence, but it does highlight how experienced vice presidential staffers can help bring order to a chaotic outsider-run White House. There have not been any reports of Vice Presidential staffers building strong networks in the White House in their own right. That does not mean it has not happened, only that it has not been reported. Pence replaced his long-time low-key chief of staff with Nick Ayers, who had been the key liaison between the Trump campaign and Pence's team in the election. He was brought on to help the VP advocate for his preferred policies within the White House. (There is nothing new under the sun, Mondale's chief of staff Richard Moe focused his energies managing the president-vice president relationship.) While we have not seen much about Ayers, it would be no surprise to see him playing an expanded role in his own right. The House and Senate are often linked to private clubs or fraternities in which it helps enormously to have been a member and to know the secret handshakes. Ms. Collins said she was talking with Arizona Sen. John McCain, another “no” vote, when she felt a tap on her shoulder. It was Mr. Pence, who was at the U.S. Capitol to break a potential 50-50 tie vote. “He has always been extremely courteous in his conversations with me. He then started talking with John, we were reminiscing in some ways, and then it was obvious he wanted to have a private conversation with John about the bill, so I stepped aside and did not participate,” she said. So we see that Pence has access, he is in the mix of White House policy-making. But that does not guarantee influence - particularly in the currently chaotic administration. Does any of these vantage points - either personal or by proxy - translate to substantial policy influence? 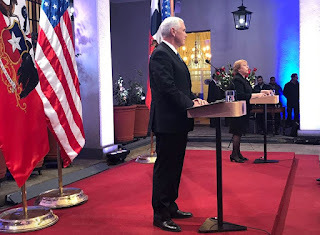 Quick note, I have two blogs - this one which started out as sort of the commentary track to my dissertation on the vice president, but now is more broadly on presidents, politics, and White House process. And then Terrorwonk, which started out on terrorism and has expanded to international affairs, technology, and ideas in general. This particular rant is unique because Part 1 is at TerrorWonk because it is about the policy aspects of Afghanistan. Part 2 is about the struggles in actually making policy on Afghanistan and the Vice President's increasingly significant role. Also, I was originally going to entitle this Sympathy for the Donald, but my sympathy for the President has evaporated. The president is really wrestling with making policy towards Afghanistan. There are no good choices. But besides the fundamental challenge of choosing what flavor of unpleasantness he wants to spend the rest of his presidency dealing with - the president is also facing institutional barriers to changing policy. It is possible that the president is ready to call it quits in Afghanistan. But the National Security Advisor, H.R. McMaster, believes in the nation-building/counter-insurgency mission (and has some pretty serious credibility at it). So when the president asks for options, he keeps getting more counter-insurgency and less withdrawal. It is likely that McMaster has the backing of DoD (and possibly Kelly as well.) The DoD isn't going to want to lose a war it is currently fighting. A more skilled president would know a bit more about working the system to obtain more options, but the current denizen of the Oval Office does not possess significant experience on national security issues or with large bureaucracies. This frustration with and inability to manipulate the bureaucratic politics may have been one of the reasons the president proposed sending mercenaries. And this is where the VP comes in. According to some reports, Pence played a central role in overseeing the policy review process. While some insiders claim that Pence was allied with McMaster in pushing for more troops, Pence himself stated he played the honest broker role gathering information, mapping out scenarios, and presenting options to the president. The first observation is that this implies that the president has a pretty high level of trust in the vice president. Pence has been exceptionally loyal and an effective ambassador on the national and global stage. That has built his internal capital with a president who values loyalty, but whose messaging has been plagued with controversy. It also highlights that there may be problems in the national security process. It is not the case the McMaster is not capable. He is a PhD, best-selling author, successful battlefield commander, and successful counter-insurgency innovator. But if Pence is the honest broker in the process, then it appears that the president does not have complete confidence in his National Security Advisor. Any review of the history of the NSA highlights the importance of a close working relationship with the president. Without this, no NSA can hope to be successful. Although, if McMaster was a constant proponent of sending more troops - which the president did not really want to do - then charging Pence with guiding the process actually makes sense. Finally, Pence's role echoes that of Biden. Obama too engaged in a top to bottom review of the war in Afghanistan. Knowing that the military was pushing for large-scale, open ended troop commitments, Obama charged his vice president with creating alternatives. The point was to give the president time and space to make his own decision and the vice president had the standing to do it. Except that in the current case, it looks like the president - rather than getting new options - ended up with pretty much the policy his NSA was pushing. From the outside, it appears that Pence does have some opportunities for influence. VPs always have to choose their battles. Gore stayed out of healthcare and Bush Sr. stayed out of economics policy. Cheney wasn't really interested in domestic affairs at all. With this president, who is um... mercurial, so that policy can change very quickly, it is even more important for the VP to choose where to use this hard won internal capital. If this reporting on the Vice President's role in the Afghanistan review is accurate, it also reflects on the outsider/insider paradigm. This concept (at the core of my research) is that presidents with limited Washington experience turn to vice presidents with this experience for help. Trump has less political or Washington experience than any president in history. It would make perfect sense that he would turn to his vice president for assistance with the thorniest problems. We are watching an embattled presidency. Approval ratings, given a reasonably strong economy, are astoundingly low. The White House is in a constant state of leaky turmoil. And the president is frankly divorced from any understanding of basic political inputs and outputs. I could say more - my thoughts on that man in the White House are no secret - but my point here is to be analytical. One of my themes in studying the vice presidency is using it as a lens to understand the presidency. I thought it would be a good time to start really watching the vice president. I've started tweeting a few items daily, and here is my first blog. Probably a few times a week. But there is an analytical challenge. Over the course of several presidencies the vice presidency can be a useful indicator. But, as a short-term indicator it is more difficult to say. The signal is weak. First, most of what can be known comes out after presidents have left office and memoirs have been written. Vice presidents have traditionally kept their counsel to the president private. This was a precedent established by Mondale and - for the most part - kept since. Because of this, what we know about vice presidents may not reflect the most critical issues. Mondale (again) was involved in many things, but information about his involvement on the Soviet Union or Iran was limited. Cheney had little to say about "No Child Left Behind" or PEPFAR, two of Bush's primary initiatives. On the other hand, when Israeli-Egyptian negotiations were flagging, Carter summoned Mondale from the White House to join the parlay at Camp David. From the perspective of studying the vice president, it highlights the value Carter placed on his counsel. From the perspective of the president's needs it indicated that Carter was not doing so well with the Israelis. Mondale had a strong relationship with them and they trusted him more than the president. And that is a good place to begin. The Vice President has just cut short a trip to South America. It does not appear that the president summoned him. What was the point of his change in plans. A president saying the appropriate things would have made this a smaller and shorter story - and frankly could have had a salutary affect that we could have really used. It was the president's failure to do so that has made this a crisis. When Presidents are in political trouble of their own making, the vice president can travel and avoid the cross-hairs. So what were Pence's calculations? What was he thinking? Does he believe he can talk sense to the president and help the administration work its way out of things? Are we close to a Constitutional crisis and Pence figures being nearby is smart? Did the White House staff beg him to return? Tough to know, but interesting to consider. One important note is that for all of the leaks and reported intrigue - Pence does not appear to be a central player in this cut and thrust. He rarely appears in any form in the endless reporting. In fact the only hard exercise of vice presidential influence we've seen so far is that Pence persuaded Trump to fire Flynn. This works to Pence's favor - since Flynn was a nightmare politically, professionally, and personally. But it also indicates that just maybe the President listens to Pence. After all, Flynn was deeply loyal to Trump and vice-versa. Trump's efforts to protect Flynn, as much as anything, have endangered his presidency. This is a strong indicator that Pence thinks, or people in the White House think, that the Vice President can help put it out the self-igniting dumpster fire that is this administration. Can he? I doubt it. The Vice President elided the ludicrous and counterproductive Presidential statement that we may have military options in Venezuela, but still cited and supported the president. Say what you will about Pence, he's pretty good at walking this fine line. I wrote this yesterday morning, before Kelly's first day on the job as White House chief of staff. His opening move, firing the grossly inappropriate Anthony Scaramucci, was a good one. He has also begun reaching out to Democrats in Congress. Kelly does have significant experience there, but I'm still not certain that - as able as Kelly is - if he has sufficient political experience to pull of this role. But I believe some bigger factors, enumerated below, also will prevent him from being effective. Also, the continual controversies coming from this White House raise new challenges. Even Jim Baker (probably the greatest recent White House chief of staff - see below) would be challenged at this multiple scandal a day pace. Any discussion of Kelly's appointment to be White House chief of staff should begin with the simple and true observation that General Kelly is an extraordinarily capable man. No one should ignore the depth of his talent and experience. But in considering his prospects - before considering the external factors - it is important to consider what the White House chief of staff does. What Does a White House Chief of Staff Do? Read this if you really want to know stuff! If you have time, read this excellent book by Chris Whipple - or at least this interview. But, the summary would be that the chief of staff tries to make the White House (and to some extent the government as a whole) work for the president. Note the lower case w - not work as in be employees of, but rather organize complex institutions in a way that serves the president's decision-making needs and then carry out the president's priorities. The CoS has to coordinate White House operations. The single most valuable thing in the White House is the president's time. There is usually a deputy CoS in charge of scheduling, because it is important that the president's time support the president's priorities. Speeches and appearances should be linked to policy initiatives, contacts should be with critical interest groups, etc. This barely scratches the surface of the nuts and bolts of the CoS role. But rather than diving in deeper, let's instead turn to comparisons to Kelly. In recent history (that is my memory) there are three cases of a chief of staff being brought in to stabilize a White House in deep trouble. Howard Baker was brought into the Reagan White House after Iran-Contra, in early 1987. Leon Panetta became CoS in the Clinton White House in mind-1994. Josh Bolten became CoS for Bush 43 in 2006. Baker had been Senate Majority Leader and had served three terms in the Senate. Panetta had previously been OMB chief (which is a lesser known but hugely powerful position). He had also been in the House for 16 years. Bolten had been OMB chief, deputy CoS for policy, and White House director of legislative affairs. 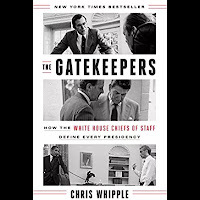 Let's add two more well-regarded White House chiefs of staff - Rahm Emanuel (Obama's first chief of staff) and Jim Baker (Reagan's first chief of staff.) Emanuel had previously been a White House staffer (and top fund-raiser) and then served three terms in the House of Representatives. Looking over these four, effective White House chiefs of staff, it looks like there are two basic paths to the position. Capitol Hill experience, White House experience, or some combination thereof. I'm not sure this bodes well for Kelly as CoS. There is little question he has the expertise for the form of the job - establishing clear lines of authority and overseeing a large complex operation. But does he have the appropriate knowledge of the substance? The substance of the White House chief of staff role is politics which is the art of the possible. Effective political action requires balancing policy preferences with political realities. This problem space has multiple dimensions. Understanding policy options requires a broad-based general knowledge. Politicians may have a few issue in which they have deep expertise, but they cannot master every issue. They do need to know enough to be smart consumers of policy. General Kelly will, undoubtedly, have vast experience with many critical policy issues, but these represent a fraction of the issues a president must address. Does he have significant experience with the federal budget, natural resources and the environment, energy policy, urban affairs, or judicial appointments? In fairness, Kelly was the military assistant to SecDefs Gates and Panetta (him again... hmmm.) He also served in the Marine Corps legislative liaison office and was the Legislative Assistant to the Commandant. So he is not a political amatuer, but his political experience is through a pretty specific lens. I haven't talked about Jim Baker, Reagan's legendary chief of staff. On paper, Baker was not particularly well qualified. He had been an Undersecretary at the Department of Commerce in the Ford administration and run political campaigns in Texas. It is worth noting that Baker so impressed Ford that he ended up running Ford's campaign. 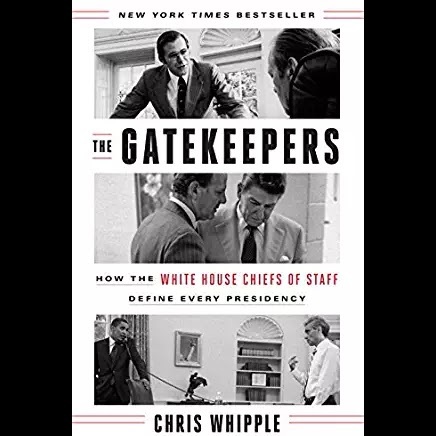 He then impressed the Reagans (particularly Nancy) so much that they made him chief of staff, despite his being an ally of their former rival, George H.W. Bush. So resume is not a definite indicator. Baker was exceptional regardless of his previous experience. So it is entirely possible that Kelly will prove excellent in the chief of staff role (we can certainly hope so.) And Kelly's own distinguished career is certainly a mark of great ability. 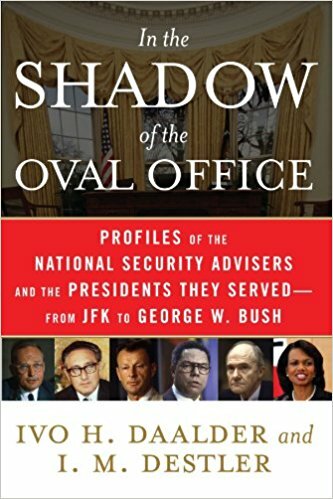 In their masterful book on the National Security Advisor, I.M. 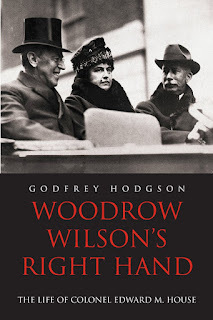 Destler and Ivo Daalder cited an old Washington hand who observed that National Security Advisors should choose their presidents wisely. I've made the same observation about vice presidents, and it also applies to the White House chief of staff. Other CoSs have struggled with presidential discipline issues. Reagan and Clinton come to mind. But, fundamentally they were political actors who understood the game and what the key outputs were. If they wanted a policy to be enacted, they would need to take certain steps. I'll write more about Trump in Presidential Time later (but here's my overview), but long and short is that the president is the type of president presiding over the collapse of a political order (last two presidents of this type were Carter and Hoover.) The GOP has dominated politics since 1981, but now the policy solutions that were successful in the early 1980s are no longer relevant. Carter and Hoover were, to a great extent, technocrats who promised to do government better. Trump, in his way, promised to do the same. g policies and groups that recognize those policies are no longer viable. We saw this dynamic play out in the health care repeal efforts where the group on the far right committed to absolute repeal out of fealty to the principle of small government and the centrist group, which saw repeal as deeply unpopular in their district, were each large enough and vocal enough to prevent effective policy-making. So regardless of the chief of staff or the president, it may be very hard for anyone - even a Lincoln - to govern effectively. Did you really think I would write all of this without mentioning the vice president? We don't know much about what VP Pence has been up to. He's been outwardly loyal, traveling a bit, and liaising with Congress. Typical and important VP stuff. I'll write more about him later as well. But vacuums in the White House are good places for VPs to play. They don't want to be fighting for power with other players, but if no one has a good handle on an issue or problem, the VP can fill the vacuum. If Kelly, will running a tight ship, needs help balancing policy and process, Pence is well placed to assist. (I wrote before that Pence would be a backstop to the chief of staff.) It is also worth noting that the White House director of legislative affairs, Marc Short, was a Hill staffer to Congressman Pence. Your humble blogger has, at his day job, been writing a bit on technology policy. Not as much here, but out in the world. Naturally, I wanted to bring this together with my first love - vice presidents. The obvious thing to write about would be actual vice presidential roles in making policy regarding technology. There are some examples, most notably Al Gore, but also Quayle (who ran a commission on the space program) and maybe some others. I could stretch and include Biden overseeing the cancer initiative. That'll be the second in the series. Mondale's most important contribution was his political judgment. He was a vital political barometer for the president, and Carter respected his opinion on the domestic implications of foreign policy decisions....In general, Carter rarely, if ever though of foreign policy in terms of domestic politics, while Mondale rarely, if ever, thought of it otherwise....Fritz, in effect, provided a needed corrective. Carter's anti-political attitudes used to drive me nuts because you couldn't get him to grapple with a political problem. He thought politics was sinful. The worst thing you could say to Carter if you wanted him to do something was that it was politically the best thing to do. There were innumerable examples of Mondale's political acumen shaping administration policy, but one great example highlighting the differing perspective between the technocrat engineer and the politician was something called MX Racetrack. It was a plan to put missiles on trains that ran in giant circles. Defense analysts and Carter liked the plan which would make it nearly impossible for the Soviets to be sure they had destroyed all of the U.S. missiles. Mondale was appalled, they had given no serious consideration to the politics. Communities did not want to be in nuclear crosshairs and environmentalists would hate it. Reagan (not exactly a missile hating dove) ultimately killed the program. All well and good - a tribute to Zbig and little vice presidents talk - but what does this have to do with technology policy? I was just at the Governing Emerging Technologies Conference, in which one of the central issues discussed was how to ensure technology is developed that aligns with people's values. This is a complex multifaceted issue. (More on this elsewhere.) But, the people who build technology - primarily engineers - are not always equipped to grapple with these questions. Not to say, in anyway, that engineers are not moral. Rather, that addressing these kinds of questions requires a different analytical toolkit - how do you even determine what is in the bounds of public tolerance and acceptance? How would you query the appropriate communities? What are the central issues? This is not just values. It is also process. There have been far too many cases of experts building IT systems that did not in practice serve the needs of the organization using them. If you do not consider people and their needs and feelings from the beginning, the product in the end will be flawed. Just as Mondale urged Carter to build politics into the process from the beginning, as we develop new technologies we should build these questions - which span social science and philosophy - into the process from the beginning. 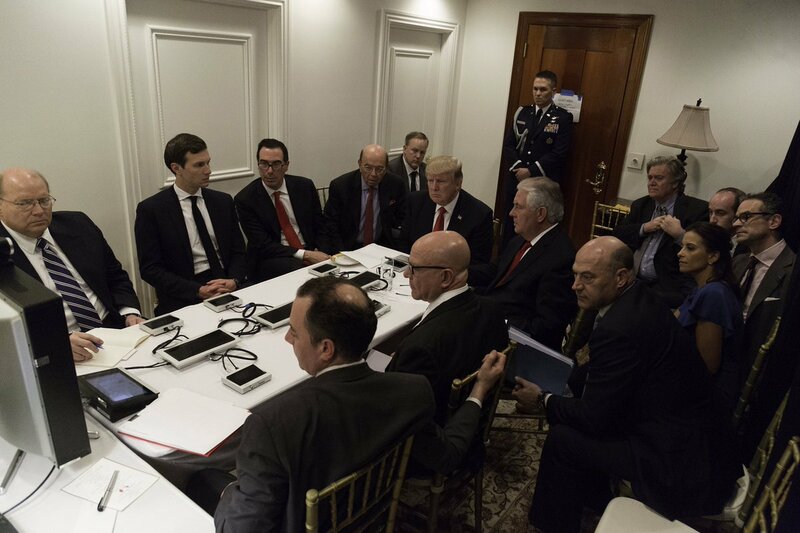 But then I looked at the picture of Trump's ExCom during the Syria strikes and something (not a Tomahawk missile) struck me. Kremlinologists long relied on pictures of the Soviet leaders to derive power. This open source effort has expanded exponentially with the Internet, allowing deep insight to closed regimes like Pyongyang. It can even serve a purpose here, in our open society, and yours truly has not hesitated to dabble in it to highlight the expanded role of the vice president. Going around the table we have on the far side of the table, facing us: Deputy Chief of Staff Joe Hagin, Jared Kushner, Treasury Secretary Steve Mnuchin, Commerce Secretary Wilbur Ross, and then the President. Sitting behind them in the corner is Press Secretary Sean Spicer. Continuing around the table is Secretary of State Tillerson, National Security Advisor McMaster, and Chief of Staff Reince Priebus. Just behind McMaster is National Economic Council chief Gary Cohn and next to him is the Deputy National Security Advisor Dina Powell. Next to Powell are Michael Anton, Assistant to the President for Strategic Affairs and Senior Advisor Stephen Miller, and chief strategist Steve Bannon. The VP, SecDef, and CJCS are all there by video-conference. Far greater presence of political advisors and staffers. Of course the Chief of Staff belongs in the room, but also the Deputy CoS and the Press Secretary? Bannon and his team have a corner and the Jared-of-all-trades even has a seat at the table. The absence of working-level national security staffers is striking. This may reflect the ongoing disconnect between the administration and the bureaucracy. The economics team is also there in the Treasury Secretary, the Commerce Secretary, and the chair the National Economics Council. I am not original in this observation - but I have a lot more to say about it. Putting aside thoughts on and preferences for specific players, what can we know about the broader structure of decision-making here. Let's start with the good. While some have criticized the inclusion of the economic team in the strike video, I'm not sure this is a bad thing. In international affairs there is often a divide between the money people and the guns people. This can lead to real discontinuities. Economic disturbances can cause security problems, while military actions can create economic problems. Yet the practitioners barely understand one another. More closely integrating these decision streams could bring better policy. The bad is the large number of political types in the room. Everyone in the White House is a political, it is the nature of the beast. But past presidents have tried to - at least somewhat - section off the policy/national security types from the political staffers. There are innumerable stories of presidents (and other politicians) telling policy experts, "Tell me what to do and leave the politics to me!" Besides the costs of appearing to make national security decisions on blatant political grounds, the reality is that the national security staffers don't give very good political advice and the political advisors don't give very good national security advice. The chief of staff plays a key role in bringing these sides together. Perhaps some other political advisors and staffers might participate, but in this care there were six politicals besides the CoS. If the attendees of this meeting were part of a carefully considered plan, great. But the reality is that it appears to have been haphazard, shaped as much by who was around. This is also highlighted by the lack of national security staffers present. Without them, you may not have the necessary people with the working knowledge of the issues. The administration has not established an orderly process and is still being run by personal whim. One can speculate as to who is up and who is down. Bannon and his crew were in the back, while new Deputy National Security Advisor Dina Powell was closer in. That Powell is also a protege of Gary Cohn could be a good sign for further integration of security and economic issues. It cannot be said often enough, good process does not guarantee good policy. But lousy process makes it really hard to get anything but lousy policy. Is Jared Kushner the de-facto VP? Interlocutor with foreign powers and critical domestic constituencies. This is the portfolio of the President's son-in-law Jared Kushner. It is also the typical portfolio of... wait for it... vice presidents!!! Vice presidents are my thing, but this pretty much sums up the kinds of things they do. From George H.W. Bush on, each vice president has chaired various policy councils and reform initiatives. Putting the VP on the case gives an extra oomph to the inter-agency process and it works reasonably well. But of course, VPs also provide critical and discreet advice to their Presidents. Often they can say things no one else can say. It looks like that is what Jared is doing. President's have discretion to organize their staff and assign responsibilities as they see fit. And every White House has courtiers. They play a number of necessary functions. Still, even putting aside specific questions of Kushner's own experience and capabilities, there are some problems. Some of these problems are managerial, but some are deeper. Kushner is being given the role of czar - the Presidential appointee who can crack heads and break logjams. It is an appealing notion, but the actual record of effectiveness is mixed. For a White House staffer, the ideal czar issue is narrow and short-term - not huge and open-ended. The White House does not have the internal staff to run issues, their role is rather to push and prod the bureaucracy. Kushner's issues however are huge and open-ended. Kushner has also been tossed a vast number of issues very quickly. It is difficult to see how anyone could work many of them effectively at the same time. Further, many of these issues (like relations with China) are considered by the interagency process. This process can be slow and cumbersome - it is also necessary to ensure critical aspects of an issue are not missed. Giving an overwhelmed White House staffer this broad portfolio is a recipe for policy freelancing and missing key factors. In general, presidents have tried to separate the national security process and the political calculations - bringing them together in a very tight circle. This is not a firewall, senior White House political staffers certainly have input on major national security decisions. But if politics are injected to early into the national security debate, it discredits the decision-making. 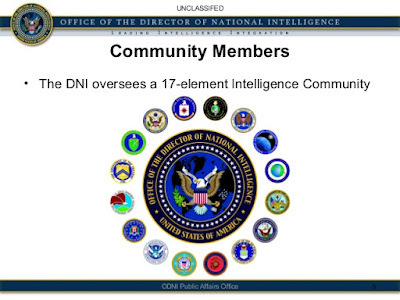 The roles played in national security by political advisors have been limited. The White House chief of staff, for example, does not have time to act as an emissary abroad - liaising with congress and the media is more than enough work for anyone. If a czar is needed for a particularly big or high-profile issue, that czar is more likely to be a cabinet official or the vice president. These figures bring greater stature to the role which can be important in pressing through change and for reassuring the public that the issue is being taken seriously. Cabinet officials are confirmed by Congress and vice presidents are elected. If it is an issue of national concern, the key official should in some greater sense be accountable. Conceptually there is a distinction between line and staff. A senior aide for a powerful congressperson may wield more de facto power than a junior congressperson. The aide, no matter how important, is still staff and can be fired by their principle. The congressperson is answerable to voters - to the American people. I cannot say, categorically, that any single role taken on by Kushner is unprecedented. There have been occasions where domestic political advisors addressed foreign policy issues. They have certainly taken on domestic policy issues. And of course Kushner's oft-reported role is Trump Whisperer (ie close confidant) is not only a common White House role, but also frankly a necessary and welcome one. Taken in total, however, Kushner is taking on a broader range of White House roles than any staffer before him and at a higher profile - while also serving as a sympathetic ear. The only figure I can think of to have held a comparable role is Colonel Edward House as the surrogate to President Wilson. That was a century ago, and there was a significant difference between that case and the present. 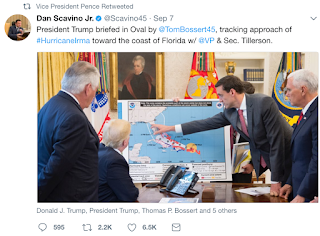 Now, when the 45th President is signaling that an issue is of critical importance, where other Presidents have sent their vice president, this President prefers to send his son-in-law. It does not appear to me that any of this, in anyway, is unconstitutional or illegal (although it may be organizationally unwise.) But it does seem, deeply and profoundly off. The paper was an expansion on my recent piece for War on the Rocks about the vice president's role in national security affairs. For WOTR I tried to provide a sort of user's guide for the in coming president about how vice presidents can be helpful. In the academic paper I tried to be a bit more well, academic. My dissertation asked the question of why the vice president went from nothing to something over the past forty years (others have asked that question as well.) My major findings (no surprise to my regular readers - again, assuming I have any) is that we keep electing outsiders with little experience in Washington to the presidency. Those outsiders encounter policy vacuums where political insider VPs can help. Congress is the big one, but others crop up. My dissertation left me with the question of what exactly is this insider knowledge that the outsider presidents lack and the VPs can provide? Look, presidents have access to lots of advisors, what is so special about the VP? To answer that question I looked across the five insider presidents serving outsider presidents to see if any areas regular popped up across administrations. I didn't exclude Quayle, but didn't expect to find much. Not his fault, he was VP to the wrong president. The key was to look for specificity. To say VPs help balance politics and policy is a bit general. To say that they help the president understand sentiment in congress and whether or not a particular bill can be passed is closer. The most interesting finding was that each of the five VPs played a substantial role interacting with the intelligence community. Mondale: Oversaw administration efforts to reform the intelligence community including the Foreign Intelligence Surveillance Act and drafting a CIA charter. Bush: Former DCI, helped develop intelligence options for countering terrorism as chair of the Task Force on Countering Terrorism. Gore: Pressed the IC to incorporate public health and environmental issues in their analysis. Along with his VPNSA Leon Fuerth, advised the president about intelligence operations including outing Iranian agents after the Khobar Towers bombing and carrying out covert renditions. Fuerth and Gore looked into the intelligence about an alleged assassination plot against former President Bush. Fuerth oversaw sanctions on Bosnia. Cheney: Architect of the intelligence response to 9/11. Biden: Brokered a dispute between DNI and DCI over who would appoint station chiefs. This short list is about what is publicly known. It was happily augmented by another WOTR article that discusses the VP's role shaping the all-important President's Daily Brief. There may be a great deal more as documents are declassified, oral histories compiled, and memoirs written. The point here is that VP's tend to wind up engaging with the IC. With my academic hat on, I want to investigate this further to understand what this can tell us about the president's needs and the role of the IC. But the pundit in me is also intrigued. The President has famously feuded with the intelligence community, but now is trying to mend fences. But this might require more than a public appearance. Understanding and working with complex bureaucracies can be challenging, even without a political backdrop of distrust. However the President will need the CIA to carry out many of his policy goals. Further, the world is a complex place and the president may actually find he needs the CIA to help make sense of it, particularly as unexpected crises emerge. My past research suggests that Pence could play a central role in mending that rift and helping the intelligence community meet the president's needs, while interpreting the intelligence community for the president. As more than a few wags have observed, this administration will test a number of political science theories. This one is another.